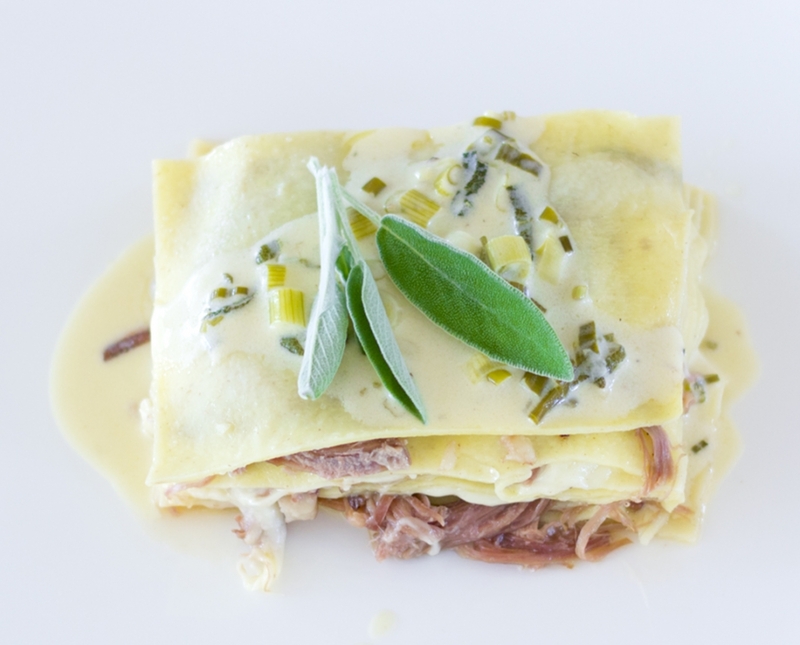 A classic Italian dish that he reinvented for the contemporary “Quebecers” who he knows so well; Duck confit and Shiitake mushroom lasagna enhanced with a creamy-white wine fresh sage sauce, totally divine! 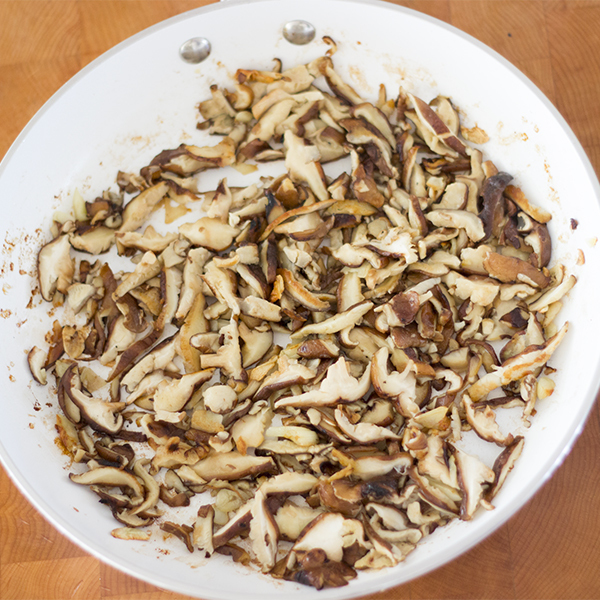 Remove shiitake stems, slice and transfer in a big pan. 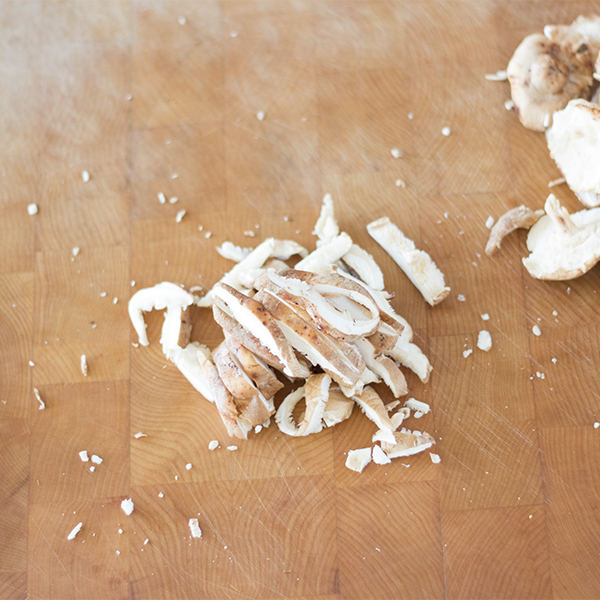 Mince garlic and add to shiitake with 4-tablespoons olive oil, salt and pepper to taste. Cook oven medium heat 6 to 8 minutes, stirring from time to time, remove from heat and set aside. 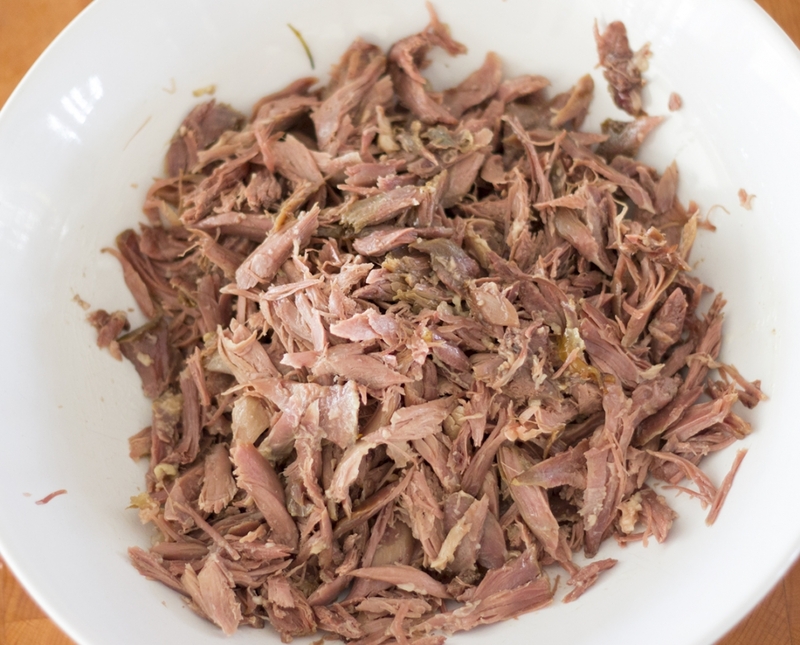 Debone duck legs, place meat in a bowl and set aside. 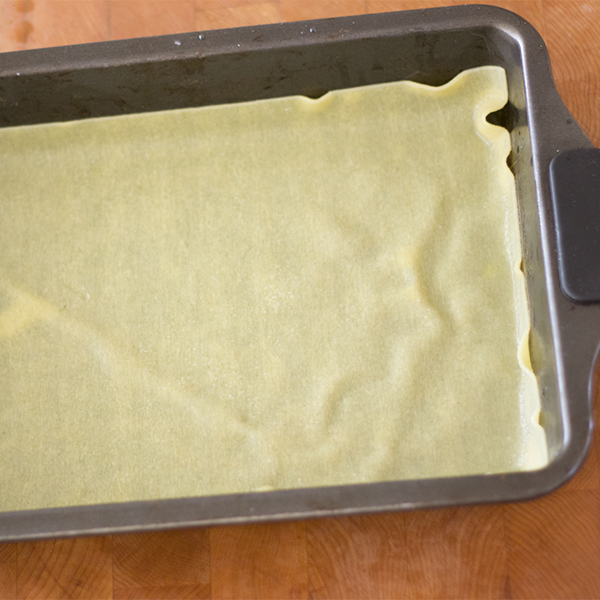 When water is boiling, cook lasagna sheets (about 4 minutes) or until al dente. When cooked, transfer lasagna sheets in a bowl with cold water to stop cooking. Preheat oven at 400˚F. 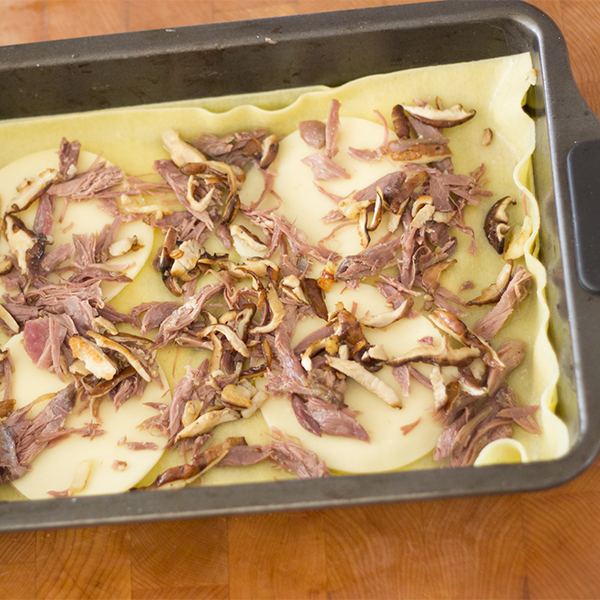 Pour a ladle full of broth and olive oil drizzle in the bottom of lasagna pan and place first lasagna sheet. Add provolone cheese, a small quantity of duck meat and shiitake mushrooms, a ladle full of broth and olive oil drizzle, salt + pepper to taste. Repeat these steps on 7 layers. 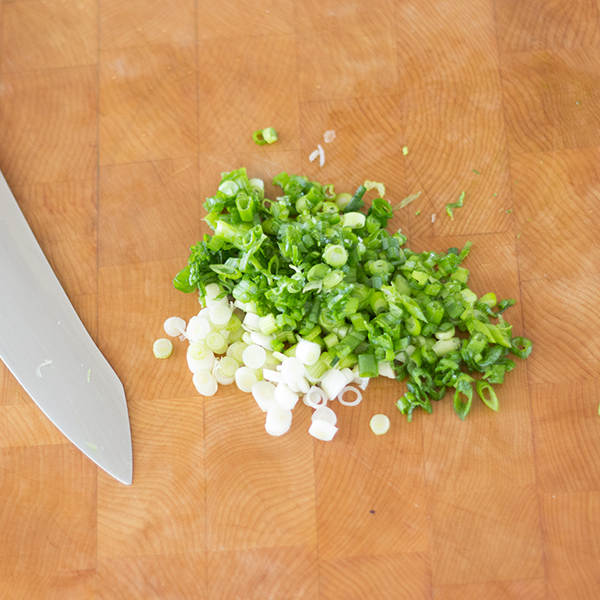 With a sharp knife, cut excess of pasta on the sides of pan. Add the last lasagna sheet on top with a ladle full of broth. 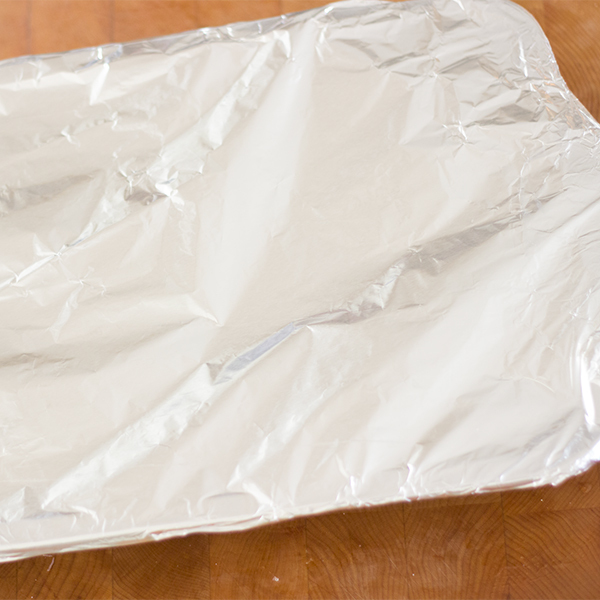 Cover with aluminum paper, cook in oven for 40 minutes. Meanwhile, mince shallots and sage leaves. 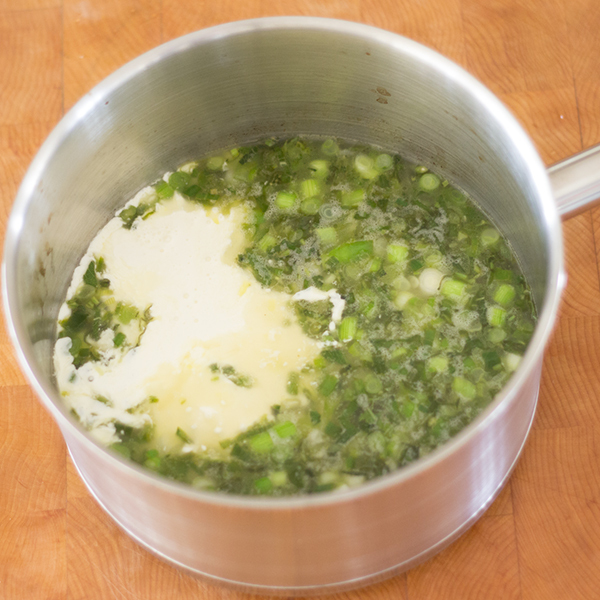 In a small pan, meld butter oven medium heat 30 seconds to a minute. Add shallots and sage and cook over Hi heat 30 seconds. Add a cup of white wine and bring to boil. Add a cup of cream and let reduce over Hi heat 10 minutes. You should have about 1-1/3 cup and of sauce left. Add salt and pepper to taste. 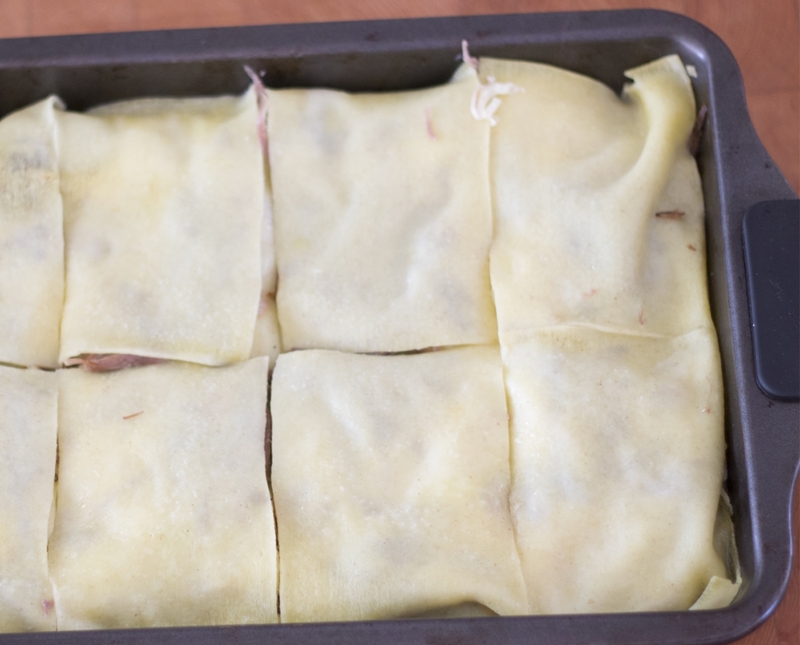 When lasagne is cooked, remove from oven and slice in 8 portions. Serve with 2 tablespoons of sauce and enjoy! 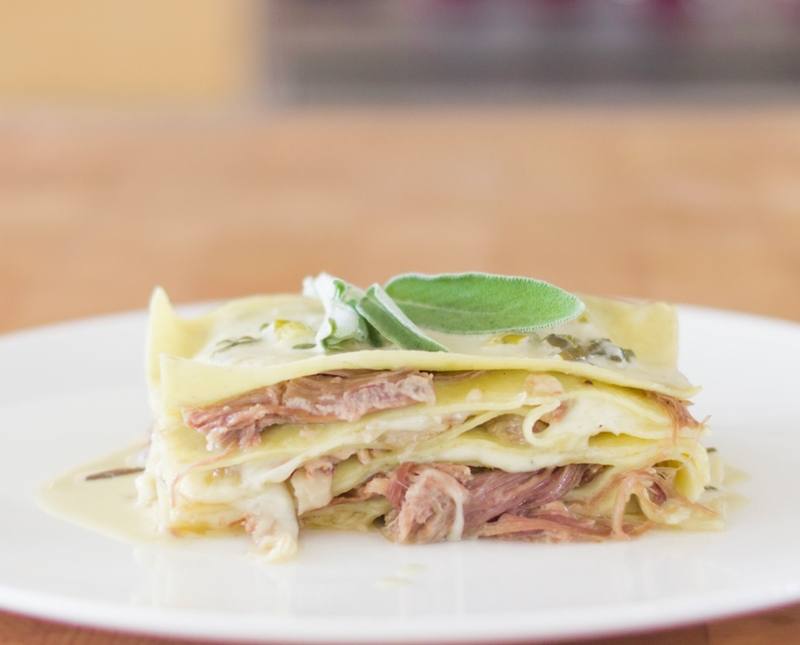 Substitute Replace creamy sage sauce with Alfredo. 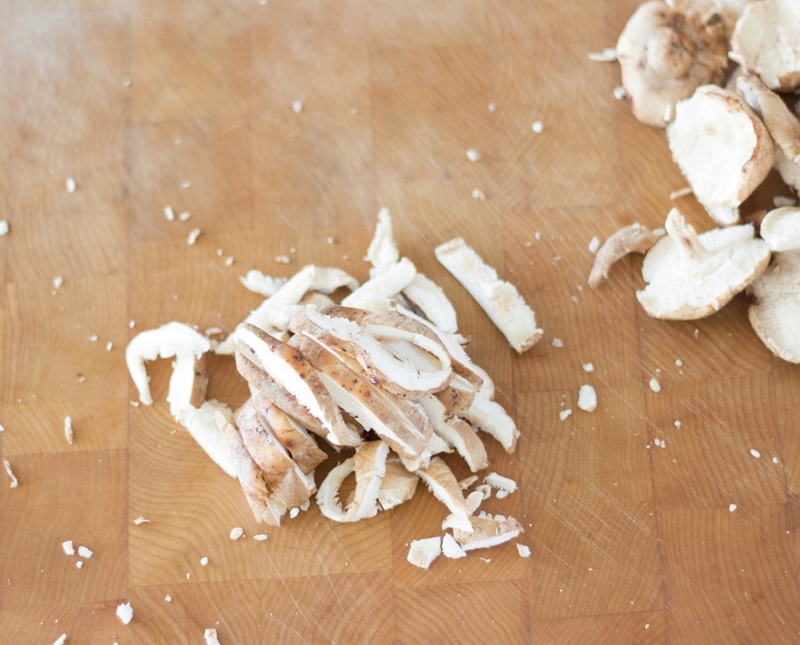 Suggestion Shiitake mushrooms can be replaced by oyster, Portobello or white mushrooms. Substitute Replace provolone cheese with mozzarella, Gruyere or any other cheese. 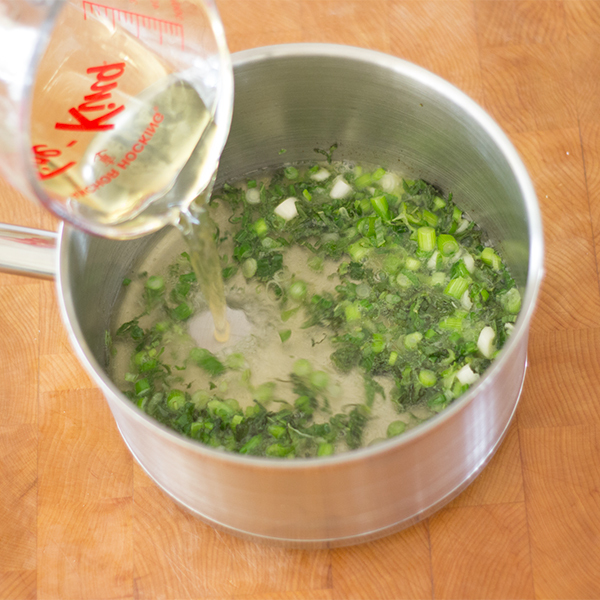 1 - Bring a large pot of salted water to boil. 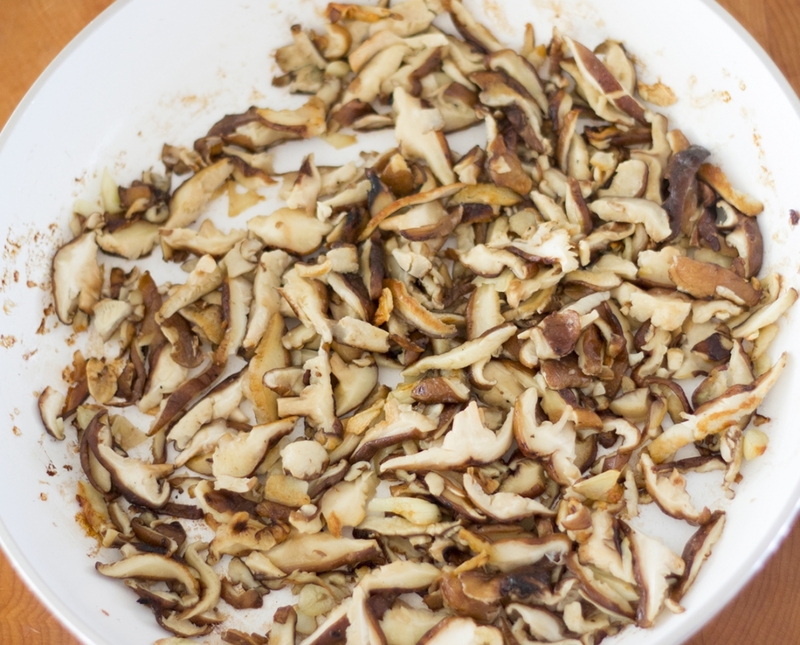 Remove shiitake stems and slice. 2 - Transfer in a big pan. Mince garlic and add to shiitake. 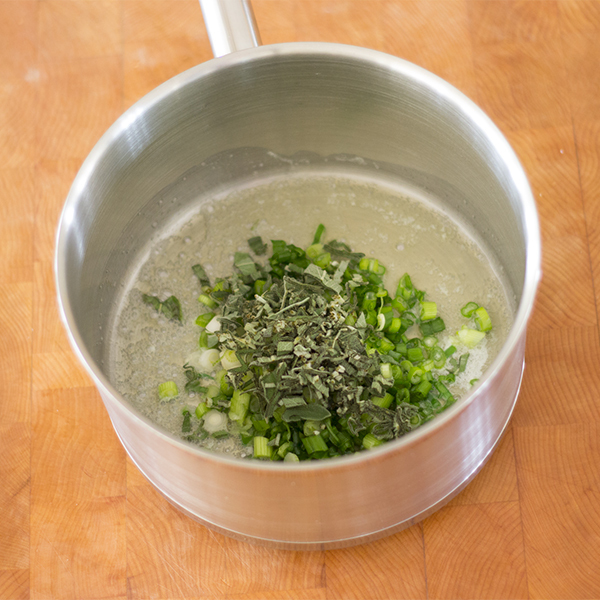 Add 4-tablespoons olive oil, salt and pepper to taste. 3 - Cook oven medium heat 6 to 8 minutes, stirring from time to time. Set aside. 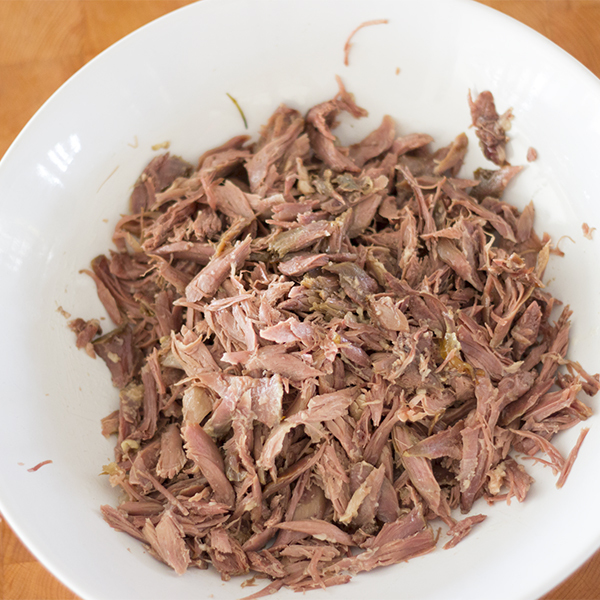 4 - Debone duck legs, place meat in a bowl and set aside. Preheat oven at 400˚F. 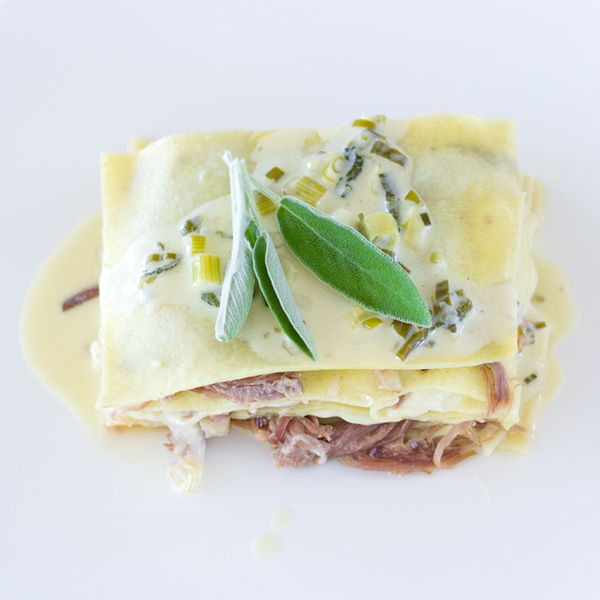 5 - When water is boiling, cook lasagna sheets until al dente. Transfer lasagna sheets in a bowl with cold water to stop cooking. 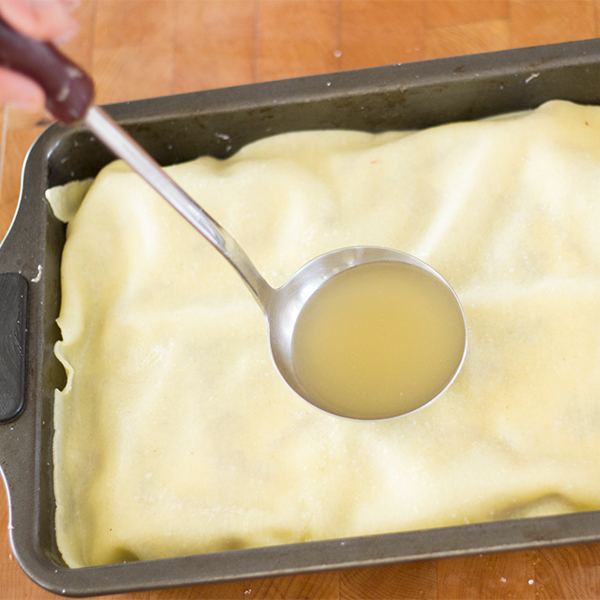 Pour a ladle full of broth and olive oil drizzle in the bottom of lasagna pan and place first lasagna sheet. 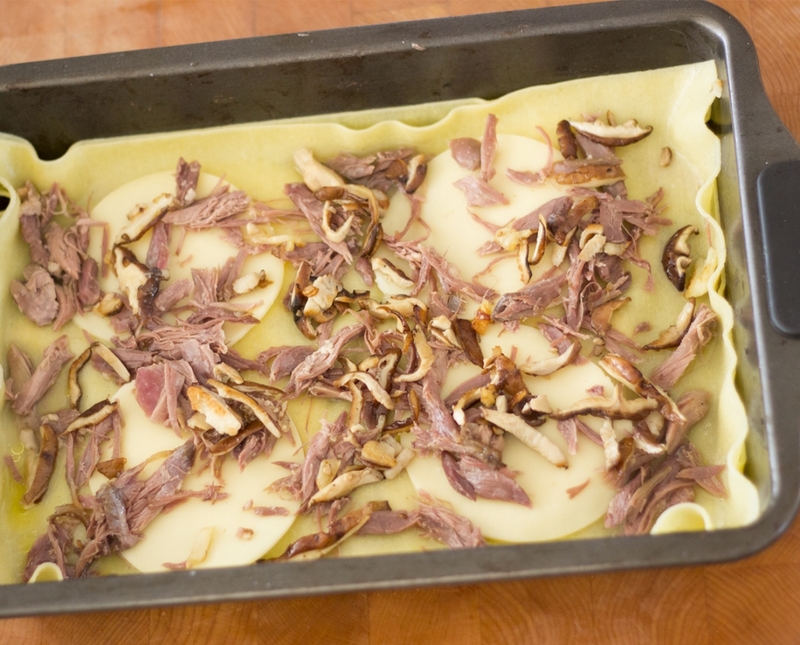 6 - Add provolone cheese, a small quantity of duck meat and shiitake mushrooms, a ladle full of broth and olive oil drizzle, salt + pepper to taste. 7 - Repeat these steps on 7 layers. 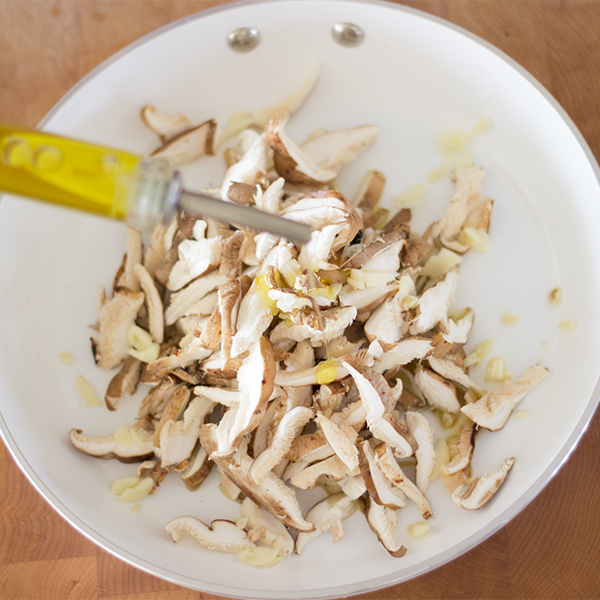 With a sharp knife, cut excess of pasta on the sides of pan. 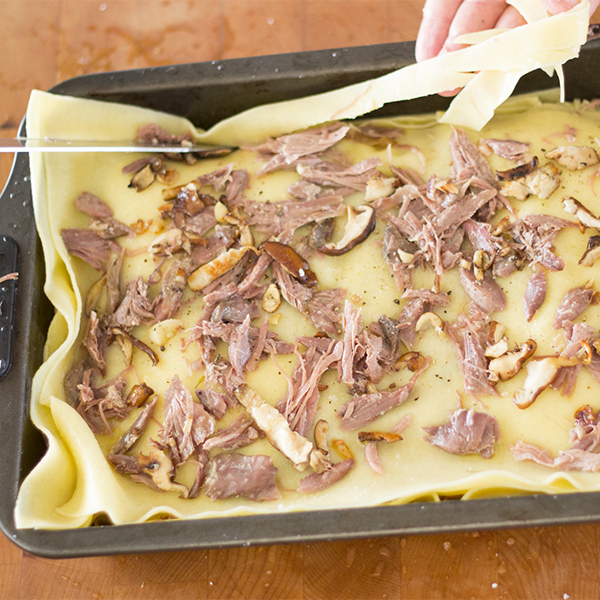 8 - Add the last lasagna sheet on top with a ladle full of broth. 9 - Cover with aluminum paper, cook in oven for 40 minutes. 10 - Meanwhile, mince shallots and sage leaves. 11 - In a small pan, meld butter oven medium heat 30 seconds to a minute. Add shallots and sage and cook over Hi heat 30 seconds. 12 - Add a cup of white wine and bring to boil. 13 - Add a cup of cream and let reduce over Hi heat 10 minutes. You should have about 1-1/3 cup and of sauce left. Add salt and pepper to taste. 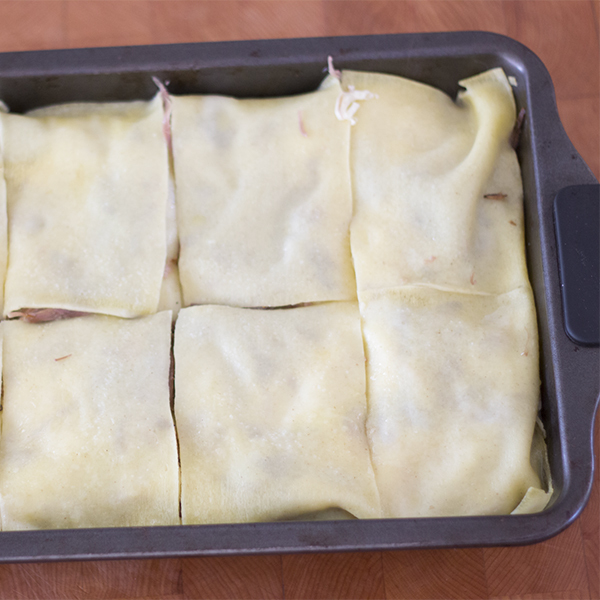 14 - When lasagne is cook, remove from oven and slice in 8 portions. 15 - Serve with 2 tablespoons of sauce and enjoy!